The first sign of failure during Tuesday’s doomed launch of an Orbital Sciences Corp. Antares rocket from Virginia came from the booster’s first stage about 15 seconds after liftoff, according to engineers studying what triggered a fiery mishap that destroyed a commercial cargo craft heading to the International Space Station. The rocket’s 13-foot-diameter first stage, containing tanks with more than 50,000 gallons of kerosene and liquid oxygen propellants, is made in Ukraine and powered by Soviet-era engines built in the 1970s for Russia’s moon program. “Evidence suggests the failure initiated in the first stage after which the vehicle lost its propulsive capability and fell back to the ground impacting near, but not on, the launch pad,” Orbital Sciences said in a statement released Thursday. The company’s acknowledgment that the failure occurred in the first stage is not a surprise, but it is the first detail to be revealed in the investigation into the cause of the rocket crash at NASA’s Wallops Flight Facility on Virginia’s Eastern Shore. 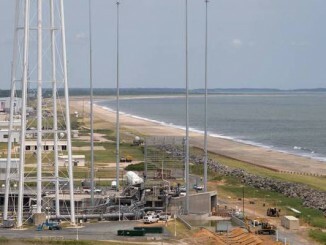 A range safety official triggered the Antares rocket’s self-destruct mechanism before it hit the ground, Orbital said. In an update posted Friday to Orbital’s website, the company said workers are sifting through the debris field surrounding the Antares launch pad are focusing on identifying components of the rocket’s first stage propulsion system and clearing them before bad weather arrives this weekend. 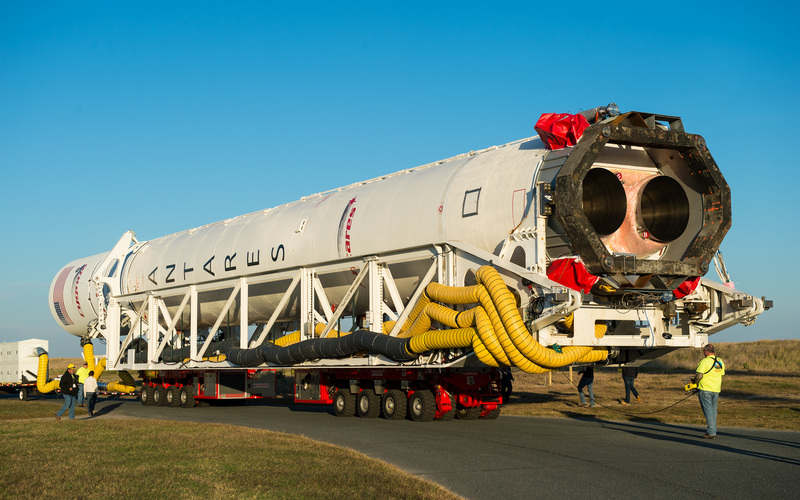 The Antares rocket’s first stage is powered by two AJ26 main engines. The kerosene-burning engines each generate 338,000 pounds at sea level. Supplied to Orbital by Aerojet Rocketdyne, the engines were built in Russia in the early 1970s by the Kuznetsov Design Bureau for the Soviet-era N1 moon rocket. Aerojet imported 43 of the NK-33 engines to the United States in the 1990s for use on American rockets. According to its website, Aerojet Rocketdyne upgraded the engine with a gimbal block to help steer rockets in flight, new wiring harnesses and electrical circuitry, electromechanical valve actuators and instrumentation. Orbital Sciences selected the engine for its efficiency — it produces more power for its weight than any other liquid-fueled engine ever built, save SpaceX’s Merlin 1D, which generates about half the thrust of an AJ26 engine. It also saved what some Orbital Sciences officials estimated was roughly $500 million in costs to develop a comparable engine from scratch in the United States. See details of the AJ26 engine’s history on our story before the Antares rocket’s first launch in April 2013. 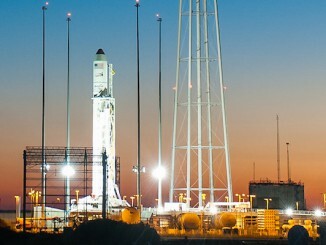 At the time it selected the AJ26, Orbital Sciences was locked out of buying the RD-180 engine from Russia. The engine flies on United Launch Alliance’s Atlas 5 launcher, and ULA said it had exclusive rights to the powerplant. The first stage airframe, including its propellant tanks, are manufactured in Dnipropetrovsk, Ukraine, by Yuzhmash, an aerospace company which also builds the Zenit rocket and upper stages for Europe’s Vega launcher. Engineers presented a first-look assessment of telemetry recorded from the rocket to Orbital’s accident investigation board Thursday. Investigators found no sign of problems during the countdown or the first few seconds of flight, according to the company’s statement. Orbital Sciences is leading the inquiry into the rocket crash, which scattered debris hundreds of feet into the air as the launcher erupted in a blinding fireball, destroying an unmanned Cygnus cargo ship packed with equipment for the International Space Station. The mission was part of a $1.9 billion contract Orbital has with NASA to delivery cargo the space station. Orbital Sciences and SpaceX won deals to resupply the orbiting research outpost after the retirement of the space shuttle. NASA and the Federal Aviation Administration, which has oversight authority for commercial space launches, will assist Orbital in the mishap investigation. Orbital appointed Dave Steffy, senior vice president and chief engineer of the company’s advanced programs group, to serve as permanent chairman of the board looking into the launch failure. Steffy held engineering and management positions in Orbital’s development of the air-launched Pegasus rocket and the Antares program. One of the first jobs of the investigation team will be the recovery of debris littering Wallops Island. Recovered rocket and spacecraft hardware will be transferred into storage bays for close-up assessments, the company said.